A recent suicide bomber in Quetta underscores the challenge facing authorities. President Mamnoon Hussain, Prime Minister Nawaz Sharif, and Balochistan’s Chief Minister Nawab Sana Ullah Zehri condemned the attack. Balochistan Home Minister Mir Sarfaraz Bugti said that the government would not bow before terrorism, and added that the blast was an effort to disrupt peace in Balochistan. The deadly assault in Quetta came at a time when the polio campaign was just getting underway in Balochistan. Striking on the third day of polio campaign, attackers targeted health workers, policemen, and paramilitary frontier corps force as they were preparing a door-to-door vaccination drive. Following the deadly assault, the polio campaign was temporarily suspended. The analyst added that polio workers in recent years have been killed in broad daylight. So why hasn’t the government moved against the perpetrators? 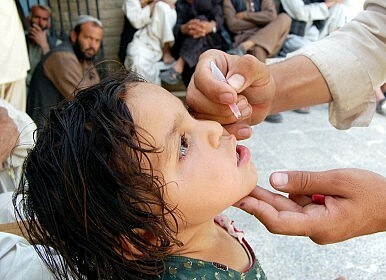 In Pakistan, hardline Islamist militant groups oppose vaccination campaigns for two reasons. First, they consider the campaigns a “Western conspiracy” to make Muslim boys infertile. Second, they point to Dr. Shakil Afridi, who ran a fake polio vaccination campaign and collected DNA samples on behalf of the CIA in a bid to locate al Qaeda’s former leader Osama bin Laden. Currently, Afridi is in a Pakistani prison facing treason and murder charges. Islamist militants call the real polio workers “Western spies.” As a consequence, Pakistan remains one of just two countries on the World Health Organization’s list of polio-endemic countries. In the past, polio workers have been targeted in Khyber Pakhtunkhwa Province and FATA (Federally Administered Tribal Areas). Following a military crackdown, Islamist militant groups have reportedly moved to northern parts of Balochistan and Quetta, and polio workers are now being targeted in these areas. Many of the workers killed have been women, despite the presence of security escorts. In fact, violence in Quetta in particular and in Balochistan in general had eased somewhat in recent months. However, the battle against militancy is still far from over, as recent deadly incidents demonstrate. For example, in recent months, a bomb explosion on a local bus in Quetta killed at least 11 people and injured 22. Despite these attacks, the Pakistani government claims to have scored significant successes against militant groups. A recent report by the Ministry of Interior and Narcotics Control claimed that 2,159 terrorists have been killed and 1,724 arrested by law enforcement agencies under the National Action Plan. The report also claimed that 98.3 million SIMs had been blocked in a bid to dismantle terrorist communication networks, and at least 933 URLs and 10 websites of militant organizations have been bloc­ked by the Ministry of Infor­mation Technology. In Balochistan, authorities say that more than 9, 000 suspected militants and criminals were apprehended in 2015. They also claim that 1,973 intelligence based-operations were conducted in the province, targeting elements involved in targeted killings, bombings, and kidnappings. Yet a Quetta-based polio official, who did not wish to be named, noted that, “Since 2012, there have been nearly a dozen killings of vaccinators across the province. All of those killed were Balochistan locals, working for this noble cause for minimal wages. As a result, there were 25 cases of polio detected in Balochistan in 2014 and seven cases in 2015.” The official added that in Balochistan most of the polio cases are from the northern districts. Besides security reasons, the official noted that communities were often uncooperative, because of misconceptions about the vaccinations. There is also growing concern that polio workers are now being targeted in the country’s major cities, with the recent Quetta attack a case in point. As a consequence, health experts fear, it is becoming increasingly difficult for Pakistan to eradicate polio. The government is failing to act to prevent the slaughter of Balochistan Shia.